The release of SOLIDWORKS 2018 brought with it an enormous amount of enhancements. This year, the Quality team was able to get in on the action so today we’re going to share our favorite new enhancements to SOLIDWORKS Inspection. This feature is a huge leap forward for companies who have already implemented, or plan to implement, MBD (model-based definition). But why? 1. 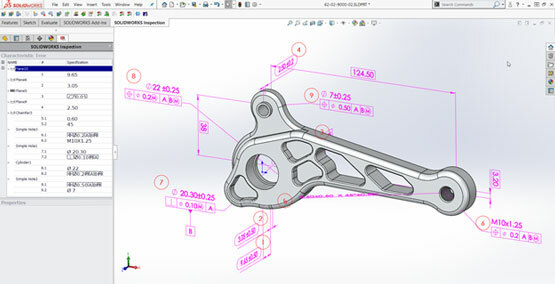 Engineering: Add PMI/GD&T info to the 3D CAD model, export to 3D PDF. 2. Manufacturing: Get PMI from 3D PDF viewed on a monitor out on the shop floor. 3. Quality: Balloon 3D CAD drawing to inspect critical characteristics. The issue? Step 3 was missing. Using DimXpert to include the PMI/GD&T information directly on the CAD model is great but before SOLIDWORKS Inspection had 3D file support, the quality department still required a 2D drawing to add their balloons. Adding support for 3D files now allows the quality person to balloon the CAD model containing all that sweet, sweet PMI, eliminating the need for the quality department to consume 2D drawings and effectively closing the loop. Either the engineer/drafter running SWX had to auto-balloon the drawing before saving it as an Inspection project and kicking it over to Quality, or the quality person needed to borrow a SOLIDWORKS CAD license so they could auto-balloon it themselves. Shop floors aren’t always going to be able to get a SOLIDWORKS drawing. Believe it or not, but there are still companies out there not using SOLIDWORKS! A large amount of the PDFs that Quality receives are basically fancy image files. This means they have to either place balloons manually or use the OCR tool. Luckily, nearly every CAD system can save drawings as a DWG or DXF file. This thought continues below with the next new enhancement—read on! The nice thing about both DWG & DXFs is they contain a readable metadata layer. The new SmartExtract selection tool takes advantage of that searchable layer by allowing users to auto-balloon DWG & DXF drawings in the standalone version. You can either select characteristics individually or balloon several at the same time by dragging a box around all characteristics you would like included on the report, and voila! Your balloons will auto-magically populate while it simultaneously extracts all the corresponding data for your inspection report. These are our top 3 favorite new features in SOLIDWORKS Inspection 2018, but there are many more beyond what we covered. To view the full list of enhancements, click here. If you are interested in learning more about SOLIDWORKS Inspection and how it can help streamline your quality control processes, drop us a line, we’d be glad to answer your questions. Also, check out our Inspection Video & Resource Library for other related content.